"Playing Card Art Collectors Extraordinaire" by Rod Starling. Download as Adobe Acrobat file (622 Kb. PDF). "Some Facts About Facsimiles" by Rod Starling. Download as Adobe Acrobat file (962 Kb. PDF). "Something New and Topical" by Rod Starling. Download as Adobe Acrobat file (1 Mb. PDF). "Tales From the Stage" by Rod Starling. Download as Adobe Acrobat file (300 Kb. PDF). "Shuffling Along With History" by Rod Starling. Download as Adobe Acrobat file (2 Mb. PDF). "Piatnik: High Quality & Longevity" by Rod Starling. Download as Adobe Acrobat file (1300 Kb. PDF). "Three Rare Playing Card Back Designs" by Rod Starling. Download as Adobe Acrobat file (1.03 Mb. PDF). "Bézique Markers 1860-1960" by Tony Hall. Download as Adobe Acrobat file (1760 Kb. PDF). "Evolution of Whist and Bridge Boxed Sets, 1870s–1930s" by Tony Hall. Download as Adobe Acrobat file (1330 Kb. PDF). "Goodall Patience Boxes" by Tony Hall. Download as Adobe Acrobat file (770 Kb. PDF). "Majority Calling and Value Bidding in Auction Bridge; a little bit of history" by Tony Hall. Download as Adobe Acrobat file (330 Kb. PDF). "The Personalities and Books which shaped the game of Whist, 1860-1900" by Tony Hall. Download as Adobe Acrobat file (1 Mb. PDF). "Piquet: the game and its artifacts" by Tony Hall. Download as Adobe Acrobat file (750 Kb. PDF). "Poker Patience" by Tony Hall. Download as Adobe Acrobat file (500 Kb. PDF). "Kuhn Khan" by Tony Hall. Download as Adobe Acrobat file (600 Kb. PDF). “Owen Jones: his work and his legacy part 1 / part 2” by Ken Lodge, a fully illustrated guide to DLR backs from 1844-80 which were either by Owen Jones or inspired by him. "A Moorish Sheet of Playing-Cards" by Simon Wintle. Article about the introduction of playing-cards into Europe. Download as Adobe Acrobat file (400 Kb. PDF). "Ernesto Flaiban: playing-card manufacturer in Buenos Aires (1936-70)" by Simon Wintle & Diego Flaiban. Download as Adobe Acrobat file (2 MB PDF). 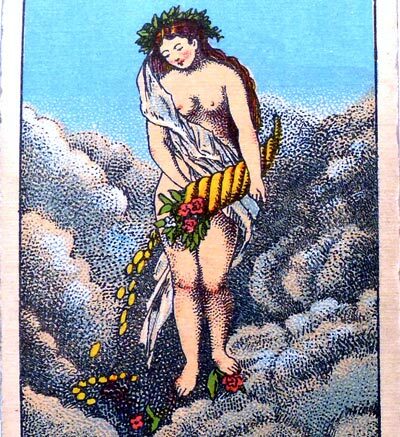 Tarot cards by Nicolas Bodet (1743-1751). 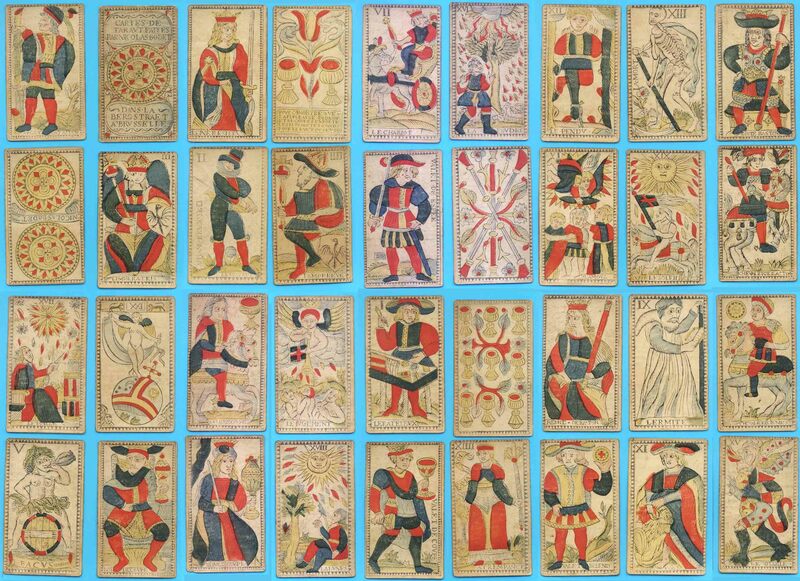 An early example of the "Rouen/Brussels" Latin-suited tarot, probably the earliest we know actually made in Brussels (466 Kb JPG). Livre du Destin or Book of Fate nineteenth century Cartomancy deck, with titles in French and English, published by Chartier-Marteau & Boudin and printed by B.P. Grimaud, Paris, c.1890. 32 cards. Download entire deck (21 MB) as large size images, suitable for desk-top publishing into hand-made deck. Images courtesy Gilles Daigle. "Shipman's Guide: early card packs and the arcana" by Diane O'Donovan. Article about the pack of playing-cards. Download as Adobe Acrobat file (60 Kb. PDF). "Michael Scot's rebus figure of 'Juppiter' as prototype for the tarot pack's Magus/Bateleur" by Diane O'Donovan. Download as Adobe Acrobat file (42 Kb. PDF). "The place of The Fool" by Diane O'Donovan. Download as Adobe Acrobat file (1.5 Mb. PDF). JSTOR (www.jstor.org) provides a growing number of articles about playing cards which can be freely downloaded without having a full account. A selection is listed below but you can go directly to the site and search for yourself. If you would like to submit an article which you have written or images of cards from your collection to "The World of Playing Cards" please use the Feedback & Enquiries link in the page footer.